I really have to hand it to the Downtown Association for upping their efforts this summer to activate St. James Park. On top of the world cup viewings, Startlight Cinemas, and Music in the Park, several other regular events are being planned. 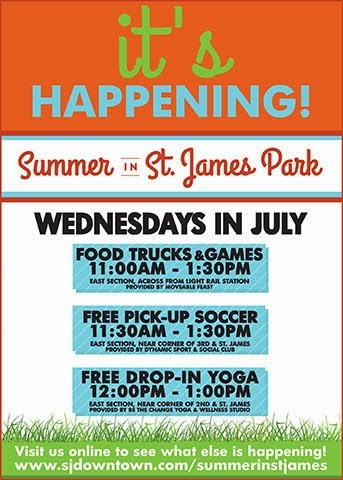 Every Wednesday in July there will be food trucks from 11am to 1:30pm, pick-up soccer games from 11:30am to 1:30pm, and free drop-in yoga from noon to 1pm. To see the full list of events just head over to www.sjdowntown.com/summerinstjames. I agree. I live downtown and have always been saddened that such a beautiful park was not more active with positive community activities. Great to see a healthy and vibrant downtown, I hope "it's [keeps] happening!" This is wonderful to see. I really enjoyed the larger than life games. Keep it up!